Recently, as China’s comprehensive national strength has gradually increased and while international cooperation has grown, China’s publishing industry’s “going global” has accelerated. Scholars said that China’s publishing has gradually moved from simply going out to being accepted by foreign readers, which reflects the charm of Chinese culture and the growing breadth and depth of its interaction with cultures around the world. As the international community wants to understand contemporary Chinese development, books with China as the theme, epitomized by Xi Jinping: The Governance of China, have been published overseas in substantial numbers. He Mingxing, a professor from the School of International Journalism and Communication at Beijing Foreign Studies University, said that books focusing on China and published at a large scale have gradually expanded from politics into economy, technology and many other areas, presenting a fuller picture of contemporary Chinese society. In recent years, China’s central government has released documents such as “Opinions on the Accelerating International Distribution of China’s Press and Publication Industry” and “Plan for the ‘Going Global’ of Press and Publication in the 13th Five-Year Plan Period” to provide policy guidance for the publishing industry’s going global. Sun Jingxin, an associate research fellow at the Institute of Contemporary China and World Research under China International Publishing Group, said that policy and program support for China’s publishing industry’s going global is becoming full-fledged. China’s global publishing channels have also diversified, Sun continued. 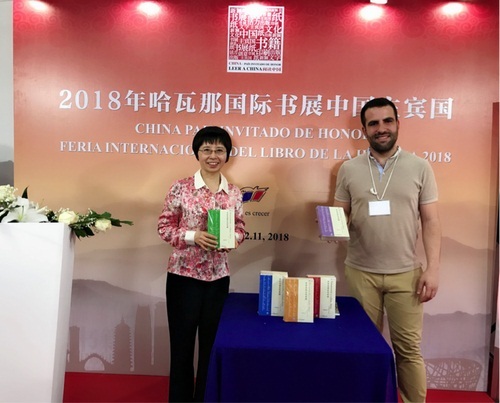 With the development of the Belt and Road (B&R) construction, the international market channels for the export of Chinese book copyrights have expanded. Exports to neighboring countries and B&R countries in particular have grown rapidly. But how to transition from going out to being truly accepted by foreign readers? Sun said that based on the current foreign demand for Chinese books and the product supply, efforts can be made in the following respects. First, the localization strategy must be implemented well. It’s necessary to put more effort into selecting topics, to research in more detail and to fully understand different markets’ points of interest about China. Second, the discourse system bridging China and foreign readers should be improved. Chinese and foreign teams joining forces to plan, write, translate and then publish overseas has become a new trend in the publishing industry. This can ensure cross-cultural communication, as the language level can be matched as much as possible. Third, the publishing agencies should spend more effort on key readers. The demand for Chinese books is relatively specific, such as overseas Chinese research institutions, Confucius classrooms, major universities and libraries. It’s therefore necessary to strengthen cooperation with these groups and solicit their opinions and feedback. Going global is not simply output. Jin Qiang, deputy director of the Department of Editing and Publishing at the School of Journalism and Communication at Hebei University, said that for China’s publishing to be truly accepted by foreign readers, it’s essential to build people-to-people connectivity via publishing as a medium, which is just one difficult part of the “five-way connectivity” (policy, infrastructure, trade, financial and people-to-people connectivity) of the B&R. To this end, China’s publishers must do more research on the market, learn the needs of readers and understand them.